I love Alfredo sauce. All that cream and butter smoothed lusciously together and then slathered on pasta – yum. What I’m not so in love with is all that cream and butter and cream and more butter. I love pasta but am also trying to switch our sides to healthier salads or bean concoctions. Amazingly, the tot inspired this recipe. 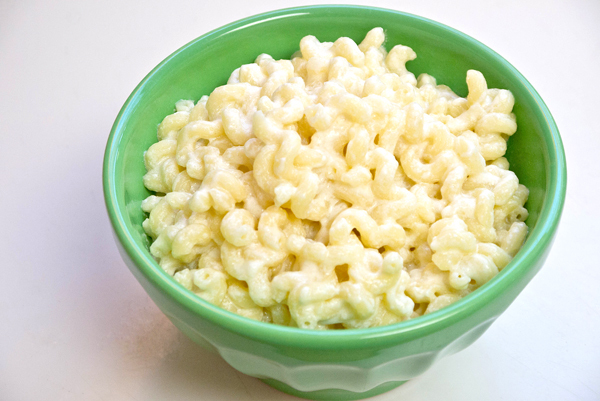 The other day I boiled up some noodles to serve plain with a drizzle of good olive oil, roasted garlic and fresh herbs when she spied the yogurt in the fridge. She insisted on having yogurt with her pasta, which kind of sounded a bit icky to me. But, whatever makes her happy, right? By the end of dinner, curiosity got the best of me and I snatched a forkful of her yogurt pasta. And, surprisingly, it was good. Sure, it needed tweaking, but it was creamy, tasty, and healthy. This is a super easy way to liven up pasta – without all that cream and butter. You can add flavors your family loves, or leave it plain and simple. Use a thick, Greek-style yogurt for making this light Alfredo sauce. Boil your pasta until tender and drain. In the same pot, melt the butter along with the chopped garlic until the edges just start to brown. Add the pasta back to the pot and stir to coat. Turn the heat to low and add the salt, yogurt, and milk. Give things a gentle stir until the yogurt has melted into the pasta. Now turn the heat off and add the grated Parmesan cheese. Mix things together, do a taste test, and adjust seasoning as needed. If you like creamier pasta, add a splash more milk. Want more cheese? Sprinkle some over the top of the pasta before serving. Hi Sarah! I’m so happy that I stumbled across your blog! I’m a teenage girl who is trying to find some healthy alternatives to some old favorites. I made the yogurt alfredo today, and it tastes great, but it is really runny/soupy and doesn’t look anything like the picture above. I followed the recipe and instructions, except for using low-fat butter and not exactly 1 cup of plain yogurt. Any idea of what could have gone wrong? Thanks! Hi Abigail – I’m so happy you tried the recipe and totally feel bad it was runny! I use a thick Greek-style yogurt when making this, what type did you use? And I would just skip the milk, which may have caused it to be runny…. Happy cooking!